Home How does Property Fit in to your Portfolio? We have long held the view that property, despite its inherent illiquidity, should be a core asset class for any long-term investor, most notably pension investors. While capital values will fluctuate to a degree with market cycles, an income producing property portfolio should deliver an attractive return over time. INDIRECT OR DIRECT PROPERTY INVESTMENT? There is a very wide range of options for achieving property exposure within an investment or pension portfolio. 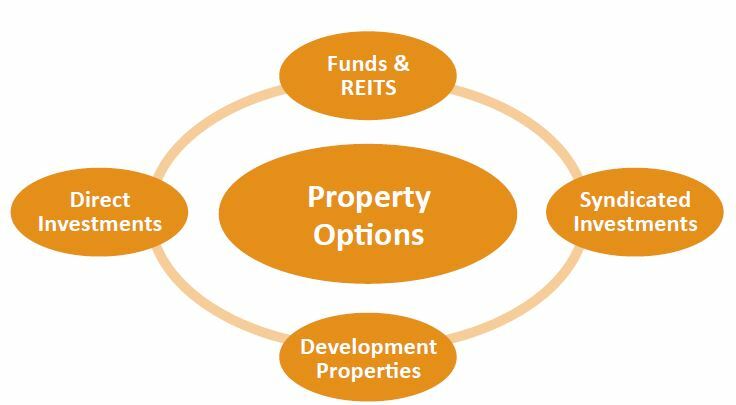 Indirect Investment in property through Funds and REITS can offer investors the following advantages. Acquiring a broad internationally diversified exposure to property in your portfolio has clear advantages over direct property investment as it spreads risk and provides geographic and sectoral diversification. Investing in property by way of pooled funds avoids all of the management headaches that invariably come with direct property investment. Superior rental yield is often cited as a reason to opt for direct investment over funds. However, net yields currently available from many property funds are comparable with those achievable from direct property. As the name suggests, liquidity is one of the foremost advantages offered by the Liquid Property Strategy. Liquidity is available on a daily basis for quoted Funds/ REITS.